From Fox News: Nation of Islam leader Louis Farrakhan, a notorious anti-Semite who recently compared Jewish people to termites, led a “Death to America” chant Sunday during a solidarity trip to Iran. Farrakhan’s trip came ahead of the Trump administration’s re-implementation of U.S. sanctions against the Islamic Republic on Monday. Speaking to law school students at the University of Tehran, the 85-year-old Farrakhan said “America has never been a democracy,” and also led a “Death to Israel” chant at the end of his talk, according to Iranian news agencies. “Today, I warn the American government that sanctioning Iran is a big mistake,” he said at a meeting with the Secretary of Iran’s Expediency Council, Mohsen Rezaei. Farrakhan noted his belief America is conspiring against Iran. Farrakhan’s trip coincided with the 39th anniversary of the 1979 seizure of the U.S. embassy in Tehran, when more than 50 American diplomats and civilians were held hostage for 444 days. The incident kicked off the Islamic Revolution, and Farrakhan told an Iranian audience that black Americans should be considered among the revolutionaries. The infamous activist cited the actions of Iran’s Supreme Leader, Ayatollah Khomeni, who ordered the release of black Americans among the 1979 captives. Video of Farrakhan leading a “Death to America” chant once again sparked calls for Democratic leaders to distance themselves from the controversial figure. 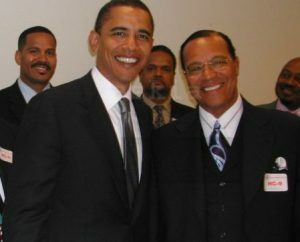 Several prominent Democrats, including former President Barack Obama, have interacted or taken pictures with Farrakhan. Donald Trump Jr. slammed Democrats Monday on Twitter. “When will the democrats disavow this guy? Answer: NEVER,” Trump Jr. tweeted. Linda Sarsour, a Women’s March co-founder and pro-Palestinian activist, has repeatedly praised Farrakhan and refused to condemn him. Tamika Mallory, another Women’s March leader, called him the “GOAT” or “Greatest of all time,” and served as a national organizer for his “Justice or Else” rally in 2015. Israeli activist, Hen Mazzig, tweeted out video of the “Death to America” chant. “Nothing, Linda Sarsour?” Mazzig wrote. The media published obituaries rehashing his spectacular boxing career and accomplishments as a “civil rights champion” and “an emblem of strength, eloquence, conscience and courage” who spoke out against racism, war and religious intolerance. But Ali’s FBI files, obtained by the citizen watchdog group Judicial Watch, paint a very different portrait of the acclaimed boxer and activist. In the 1960s, the FBI closely monitored Ali as a “security matter” due to his associations with Nation of Islam leaders Elijah Mohammad and Malcom X. The Nation of Islam followed Mohammad’s bizarre interpretation of the Koran that white people are “white devils” to be destroyed in a coming “War of Armageddon.” In April 1964, Ali’s plans to travel to Muslim countries alarmed the FBI and the agency searched his passport files and recorded that while in Accra, Ghana, Ali said he planned to bring four wives back to the US. According to one of Ali’s ex-wives, Sonji Roi, the Nation of Islam received 80% of the boxer’s earnings while he only got 20%. The FBI records also state that Ali was arrested for assault and battery in July 1960 at his parents’ home in Louisville, Kentucky and that his mother had witnessed the crime. Judicial Watch had to sue the government to get the decades-old FBI records on Muhammad Ali, noting the irony that Ali’s family is using his name and legacy to launch a national anti-discrimination campaign, “Step into the Ring,” to end racial and religious profiling. Ali’s second wife, Khalilah Camacho-Ali, and son, Muhammad Ali Jr, said their inspiration for the campaign came from their being detained, questioned, harassed, and subjected to “racial and religious profiling” by federal immigration officers at a south Florida airport, when they were returning from a Jamaican Black History month event. When he died, Muhammad Ali’s net worth was estimated to be $80 million. Actor-comedian Chris Rock has a net worth of $70 million, but says America is racist and July 4th is “Happy White People’s Day”. Actor Samuel L. Jackson, with a net worth of $200 million, says America’s police are racist. Despite being twice elected POTUS, with a net worth of $40 million, Obama told the NAACP that America is still racist because of slavery. When successful blacks, with multi-million dollars in net worth of which ordinary Americans can only dream, still insist America is racist and white people are devils, what hope is there for racial relations? Leftwing Lunacy: White paper is racist! Did you know that in 2010 in New York City, the heads of the New Black Panthers and Nation of Islam met secretly with then-Iranian President Mahmoud Ahmadinejad and forged an alliance against their common enemy — the white race? P.S. To the bashers and mockers of conspiracy theories, here’s a real conspiracy! In a speech last Saturday (Nov. 29, 2014) at Morgan State University, a black college located in Baltimore, Maryland, leader of the black Muslim Nation of Islam Louis Farrakhan — with his pasted-on hair and his malice barely concealed beneath his sinister smile — effectively calls for a race war in America by threatening that “we’ll tear this goddamn country apart” if the demands of Ferguson protesters aren’t met. The protesters want to indict white police officer Darren Wilson in the shooting death of black 18-year-old Michael Brown although a St. Louis County grand jury had reviewed the evidence and concluded that the shooting of Brown was justified and Wilson should not be indicted. Farrakhan also said the parents of teenagers should teach their kids how to throw Molotov cocktails: “Teach your baby how to throw the bottle if they can. Fight!” Farrakhan then made gestures of throwing an explosive device. Meanwhile, a group of “teens” in St. Louis seemed to have heeded Farrakhan’s call to a race war. In the early hours of Sunday, Nov. 30, 2014, 32-year-old Zemir Begic was sitting in his car in south St. Louis when a group of “teens” began banging on the car. Begic, a Bosnian immigrant to the United States, stepped out of the car and was brutally attacked by the “teens” with hammers until he was unconscious and left for dead. The suspects then fled on foot. KMOV St. Louis reports that Begic was found unconscious with injuries to his head, abdomen, face and mouth in the 4200 block of Itaska at 1:15 a.m. He was taken to a local hospital where he was pronounced dead. Surveillance video led to the capture a short time later of two of the suspects, 15 and 16 years old, who were placed in the custody of juvenile authorities. Later, a third teen, 17, surrendered himself to homicide investigators. The violent death of Begic sparked a spontaneous protest in south St. Louis’ Bosnian community with about 50 demonstrators blocking off traffic at Gravois and Itaska Sunday night. Dotson also said the strain Ferguson has put on his department is great as officers have been working 12 hour shifts and no days off, but he assured the crowd the police will be here to protect them. So what’s the racial identity of the four “teens”? Regular readers of FOTM should know by now that whenever the news media use vague words such as “teens” and “juveniles” in reference to crime suspects, those are code words for young BLACKS. In the case of Begic’s murderers, it’s no different. Here’s confirmation that his murderers are black. 1. The St. Louis Post-Dispatch reports that “A police spokeswoman said investigators do not believe race played a role in the bludgeoning death of a Bosnian immigrant early Sunday, but declined to say what police believe is the motive in the killing.” That immediately is a clue that Begic’s assailants are black. 2. The deceased’s 23-year-old sister Denisa Begic told St. Louis Post-Dispatch that “some Bosnians are upset over her brother’s death because they believe the suspects, who are black and Hispanic, targeted Begic because he was Bosnian,” i.e., white. Why would those Bosnians think the suspects are black? Because not only was the brutal attack recorded by surveillance camera (the video of which has not been released to the public), there’s an eye-witness to the killing — Suad Nuranjkovic, 49, who was a passenger in Begic’s car “when a group of at least five teens started banging on the car.” Afraid for his life, Nuranjkovic got out of the car and hid in a parking lot across the street during the attack. Are Ferguson riots a planned event? What more do I need to know about Chuck Hagel? At the Nation of Islam Annual Saviours’ Day Convention, keynote speaker Louis Farrakhan took his usual Anti-Semitic tone with a current affairs twist. Farrakhan endorsed Chuck Hagel for Secretary of Defense saying Hagel’s controversial “Jewish lobby” comments were a good thing that will save America from war for Israel. Who knew chicken sandwiches are so funny? On a serious note, Patriot Post is asking us to support the executives, franchise owners and more than 61,000 employees of Chick-fil-A for their Christian business practices, as well as their stated support for biblical values, which is to say traditional American family values. Click here to sign a petition letter! H/t FOTM’s beloved tina and Laura B.! Last Saturday night, April 14, 2012, American black Muslim leader Louis Farrakhan was the keynote speaker at the Diversity Leadership Conference in LeMoyne-Owen College, a private, historically black, 4-year college in Memphis, TN. “Now if you want to lead black people, you can’t love money more than you love your people. You can’t love the big house, the big car, more than you love the advancement of your people because the enemy prints money every day that has no value. So there is no real leadership if it’s not rooted in moral character. You want to be leaders, right? You’re sure? You’re sure? You’d better check yourself ’cause leadership is nothing to play with. Because people tomorrow, maybe in a few days, are gonna kill their leaders who’ve been sellin’ them out. 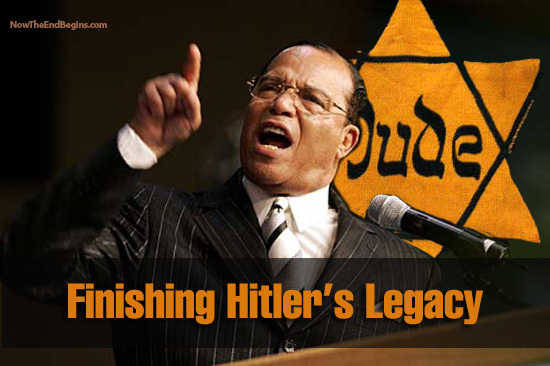 This is the same Louis Farrakhan who lives in a big house in Chicago, supported by Nation of Islam donors; who calls white people “blue-eyed devils”; who believes that salvation for black people will come in the form of a huge “mother wheel” UFO; and who praises Zimbabwe’s president-for-life dictator Robert Mugabe — the epitome of a corrupt leader — for his forced “redistribution” of white-owned land and property. Is Farrkhan’s death threat directed at Obama?